Dental implants are artificial teeth used in place of one or more missing natural teeth. A titanium ‘root’ is inserted into the jawbone to bond with the existing bone. An artificial tooth known as a ‘crown’ is then attached to the root via a connecting piece (‘abutment’). 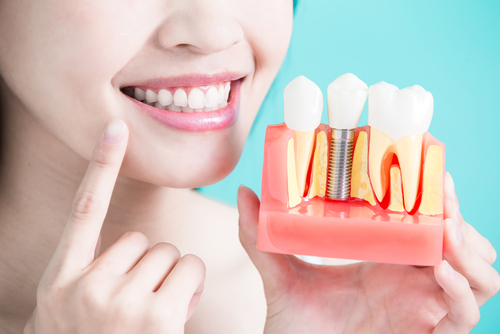 Dental implants are surrounded by natural bone and gum tissue and are generally considered a better alternative to dentures or tooth supported bridges, especially if the surrounding teeth have been weakened by large fillings or previous disease of the ligaments and jaw bone. Early implant placement to replace a lost tooth can stop the surrounding bone from disappearing and prevent the uneven appearance of gums and bone when smiling. Dental care for implanted teeth is much the same as for natural teeth and, if properly maintained, implants can last for many years. However, if neglected, implants can be affected by plaque and gum infections even more so than natural teeth due to their delicate bond with the gum tissues. Implants are not suitable for everyone. They are not recommended for children under 17 years, smokers, people with active tooth decay or gum disease, people with some medical conditions or those with certain physical or psychological illnesses that will prevent proper healing or understanding of maintenance requirements. Implants do not depend on surrounding teeth for support, so they reduce the risk of a failed prosthesis if the adjacent teeth should become loose, infected or fractured. A further advantage of implant supported crowns is they do not require the cutting or shaping of adjacent natural teeth for placement, so they are more conservative than conventional tooth supported bridges. Replacement of missing or lost teeth with implants can improve your appearance and improve the hollowed appearance of collapsed cheeks and lips. Implants are more comfortable than dentures as they are permanently fixed to the jaw bone. Implants can also act as support for dentures, which means dentures do not move, unlike dentures supported by the jaw bone and facial muscles. 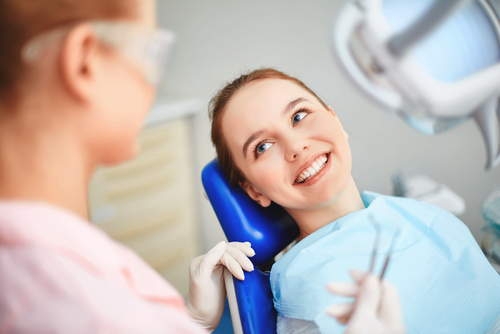 Before implant placement surgery, your dentist will perform a comprehensive dental examination, which may also include photographs, x-ray images and impressions for dental models, and refer you for a 3D cone-beam CT. It is important to tell your dentist your entire medical history before surgery, including current medicines, history of bone disease, any known surgery related problems, or if you are prone to heavy bleeding. Existing dental health problems, such as gum disease or decay, need to be treated before surgery. The size and shape of your implants are then decided upon based on the remaining natural teeth. It is important to discuss your expectations for the surgery with your dentist beforehand to ensure you are not disappointed. Your Toothkind Dentist will advise of any possible complications, risks or side effects involved with have an Implant procedure before proceeding. A local anaesthetic will be administered to the patient for the procedure. The metal root is inserted into the jawbone, which then needs to heal for up to three months before the abutment is fitted and the crown is screwed or cemented on. It is common to experience a degree of swelling, bruising or pain during this stage after surgery. However, these symptoms should resolve within a week. Ice packs and pain relief as recommended by the dentist can help to manage this. Antibiotics may be prescribed depending on individual cases. No alcohol or hard foods are to be consumed for a few days. In complex cases, time off work may be necessary. For more information or to make an appointment, please contact Toothkind.